Yesterday President Obama repeated some of these same figures, and they are pretty much the same. Total US prisoners are still 2.2 or 2.3 million, and a slight drop in the black incarceration rate makes us now a little less instead of a little more than half, but the overall picture is unchanged in a decade. The president then announced the release of forty-some nonviolent federal drug offenders out of a total of about 70,000, and stopped in at a federal prison Thursday. The same day, ex-president Bill Clinton offered a half-hearted “apology” for his 1990s crime bills, which he admitted “set the stage” for state and federal governments to nearly double the US prison population. Why? Why did President Obama wait six and a half years into his presidency to say the basic damning numbers and free a token handful of drug war prisoners? And how come Bill Clinton, fifteen years out of office chose this week to publicly admit that black mass incarceration was maybe not the best public policy? Does ISIL Have Significant Support from People Who Consider Themselves Muslims? One would like to say that the cruelty of ISIL (ISIS) shocks the entire world. In fact, however, it doesn’t shock everyone. Sad though it may seem to you or me, some people actually observe events in the emergent “Islamic State” with approval and admiration. Thousands of young men and even young women from many countries—even some from Europe and North America—are flocking to ISIL’s black banner. There are various estimates of ISIL strength available, ranging from 30,000 to 100,000. European intelligence agencies estimate that 3,000 young people have joined from the continent. One should not assume these are all uncivilized thugs, just because they inflict horrible suffering on fellow human beings. They are far from alone in doing that, or in viewing their actions as the administration of some god’s punishment. We should not presuppose, as Barack Obama suggested in his February 17 speech, that its members join ISIL simply due to such factors as unemployment, alienation and the nebulous phenomenon of “radicalization” to which some minds are strangely vulnerable. To me they appear as people with a set of serious religious beliefs, including the belief in the existence of a Supreme Being; belief in a holy book of divine authorship; and belief in a set of laws authored by this one-and-only God that—for society to function properly, and the problems posed by modernity fixed—must be rigorously implemented. From Black Agenda Report, by Glen Ford — March 27, 2012 — “Angela Davis Lost Her Mind Over Obama” — The “delusional effect” that swept Black America with the advent of the First Black President has warped and weakened the mental powers of some of our most revered icons – and it has been painful to behold. Earlier this month, Angela Davis diminished herself as a scholar and thinker in a gush of nonsense about the corporate executive in the White House. The occasion was a conference on Empowering Women of Color, in Berkeley, California. Davis shared the stage with Grace Lee Boggs, the 96-year-old activist from Detroit. The subject was social transformation, but Davis suddenly launched into how wonderful it felt to see people “dancing in the streets” when Barack Obama was elected. She called that campaign a “victory, not of an individual, but of…people who refused to believe that it was impossible to elect a person, a Black person, who identified with the Black radical tradition.”……There was a hush in the room, as if in mourning of the death of brain cells. Angela Davis was saying that Barack Obama is a man who identifies with the Black radical tradition. 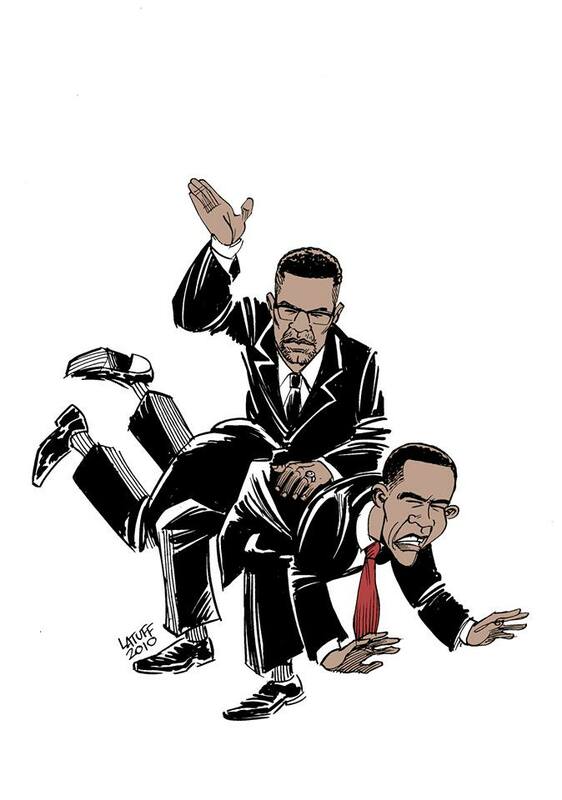 She said it casually, as if Black radicalism and Obama were not antithetical terms; as if everything he has written, said and done in national politics has not been a repudiation of the Black radical tradition; as if his rejection of his former minister, Rev. Jeremiah Wright, was not a thorough disavowal of the Black radical tradition. In his famous 2008 campaign speech in Philadelphia, Obama blamed such radicals for compounding the nation’s problems. Although racist state violence has been a consistent theme in the history of people of African descent in North America, it has become especially noteworthy during the administration of the first African-American president, whose very election was widely interpreted as heralding the advent of a new, postracial era. When considering elections in the U.S. the tendency is for voters to look at the issues placed in front of them rather than at history, political trajectory and who it is that chooses the issues? On their face Republicans, broadly considered, are more direct shills for the worst of the corporate-state— Wall Street, multi-national oil and gas companies, munitions manufacturers and replacement of any and all democratic tendencies with corporate interests. This written, Democrats have been the cleverer proponents of these same interests, the clean-up crew that poses state support as response to ‘natural’ catastrophes that are exactly and precisely the product of self-cannibalizing corporate-state capitalism. Political strategy within the mainstream, the choice between slower or faster decay, leaves out of its calculation the possibility of break and rupture that are the most likely ends. Wall Street, which counts ‘both’ political parties in the U.S. as wholly owned subsidiaries, has had three crises of increasing magnitude in as many decades. The oil mafia, the CIA-MI5-BP-Exxon Mobil-military oil and gas establishment, is launching wars at increasing cost with decreasing results except inasmuch as human and environmental catastrophes sustain it. And the ‘political’ establishment that sits metaphorically atop this morass retains public attention only through infinite iterations of manufactured cultural difference.